One of my favorite countries to visit has always been Italy. Whether Lake Cuomo, Vincenza, Venice, Rome, or Vatican City, the sites, sounds, and flavors of Italy are unique and unforgettable. Some of these flavors can be found in Philadelphia, particularly in South Philly. 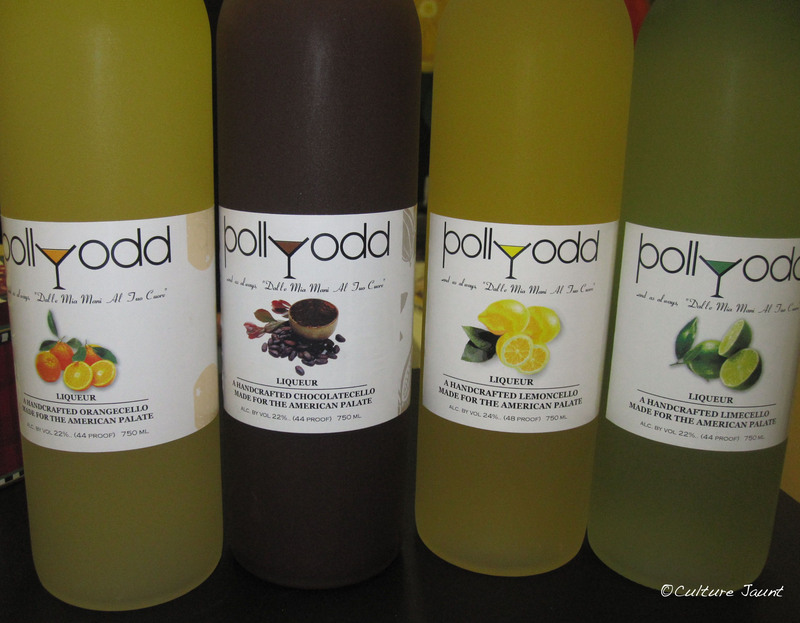 On December 21, I had the pleasure of getting to know the latest flavor added in the form a Pollyodd, locally made ‘cellos that are currently available in four flavors – the traditional lemoncello, lime, orange, and chocolate. Joan Verratti with her ‘cellos. Pollyodd, produced by Noaj & Mot, Inc., is owned by Joan Verratti and Tom Cavaliere, and has been five years in the making. Five years of having all paperwork in order, getting the right licenses, and being investigated by the FBI. A law passed in February 2012 that allows micro-distillers (who produce no more than 100,000 gallons of alcohol per year) to sell their products from their distilleries and two satellite locations. According to Tom, there are three ways to enjoy ‘cellos: As a shot (in Italy, limoncello is served as a digestivi (digestif) after dinner); in a mixed drink; or as a snow-cone. But, Joan says that Pollyodd can be enjoyed in more than just liquid form, and that she regularly bakes and cooks with the liqueurs. Her favorite is chocolate. What really stands out about Pollyodd is that everything is done by hand, local ingredients are used, and no preservatives are added. Reading the label on the back of each bottle, you’ll notice that a portion of all profits go to the Thomas J. Verratti III Memorial Scholarship Fund. A fund that Joan has established in memory of the son she lost in 1997, and that helps underprivileged children attend school in Philly. Of course, I couldn’t walk away from the visit without my own bottles and decided to go with the orange ‘cello. It’s a very smooth and sweet liqueur. So far, I have mixed it with cranberry juice (I don’t think there is anything I haven’t mixed with that yet), and the result was quite tasty. In the new year, I’ll probably be stopping by the store again because Joan and Tom plan to add five cream-based flavors to their inventory: banana, lemon, strawberry, chocolate, and orange (which I’m told tastes exactly like an orange creamsicle). You can visit the store to buy your ‘cellos or pick some up at 32 different Wine & Spirit stores. Each bottle costs $23.99 or $25.41 after tax. 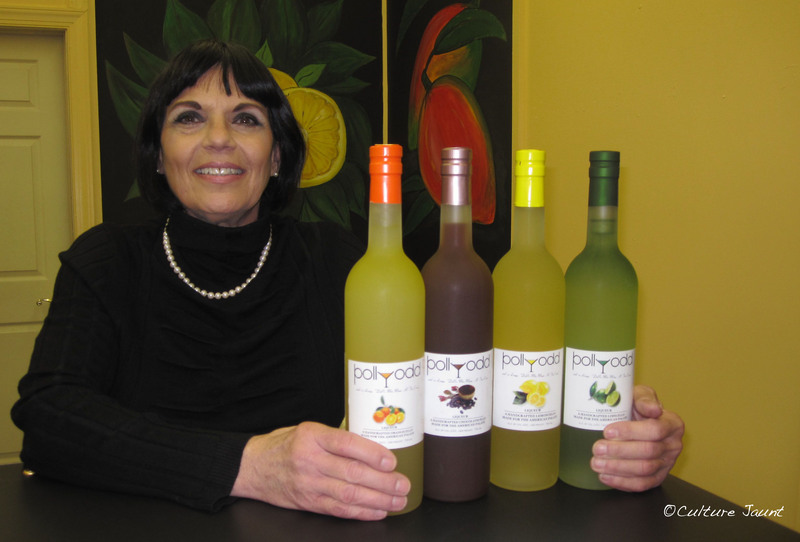 If you go in person, you’ll notice the walls are beautifully painted with the fruits of the flavors Pollyodd comes in. These paintings are done by Jessie Newcome, a self-taught artist from Costa Rica.